We’re an analytic firm, and that extends to the services we offer in data management and eDiscovery. We do litigation support, but we do so much more. We offer all the standard litigation support and eDiscovery services. We perform quality control and testing on electronic data. We can host your data, and we develop custom designed yet flexible analytics that fit your needs. Big case? How do you know if your large-scale litigation support and eDiscovery is error free? Who is checking your data-checkers? We can collect and organize your data – we’re the front end of any operation that allows you see your data in one place, tagged, organized and ready for review. We design custom samples that guarantee efficient reviews and cover multiple issues in one step. We take an analytical approach to everything. We have developed procedures to streamline data processing and get you to the point of reviewing your data fast and efficiently. We are Analytics! 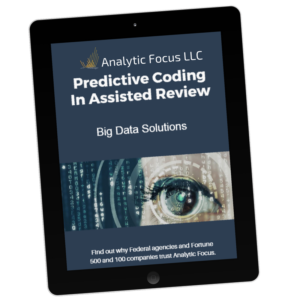 We perform all of the standard analyses, such as near duplication searches, content analysis, relationships, and predictive coding. What’s better – we actually understand how these work and can customize them to your particular problem. Big data, multiple datasets, organizing the chaos into mere complexity, finding the errant document, and linking disparate cousins into one big happy family – we can handle it. From Collection to Ingestion to Review to Production, we can organize and make your data available to you immediately, help with searches and reviews, and train your staff to make most efficient use of tools and data acquisition.